I have been a teacher for 25 years, a Headteacher for 10 years and, at the age of 49, this much I know about the trouble with educational research. Like my imaginary teacher, Masie Tubbs, the vast majority of teachers do a good job, but it is their job not an obsession. They work really hard, they juggle work and home, they get everything done as well as they can considering the demands upon them. They have years of experience, they have pretty well mastered the pedagogic basics, it’s a job they do with assured competence. They help develop responsible citizens, the examination results are good, the students’ destinations are promising. They like the students, the students like them, the parents are happy. So why would someone like Masie Tubbs feel particularly compelled to take the time to read educational research to improve her teaching at the margins of pedagogy? It’s what I call the Masie Tubbs problem and we have to solve it if we are going to increase the influence of educational research on students’ outcomes in our schools. 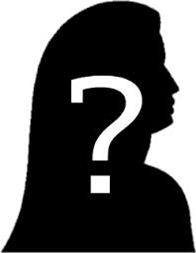 One who spends an inordinate amount of time exchanging remarks in computer chatrooms or participating in discussions in newsgroups or on bulletin boards. Words related to spod: Geek; Nerd; boredom. Remember the bleedin’ obvious. Teacher research has to address questions to which teachers really need an answer. It’s pointless doing research which ticks the research box but which doesn’t improve the impact of teaching upon students’ learning. 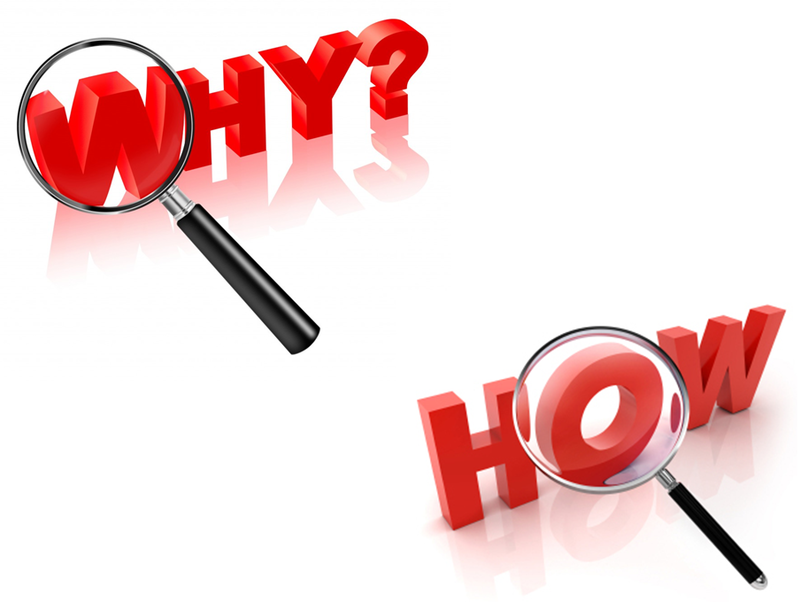 Understanding the validity and import of research findings is another thing altogether. Even if we read the research, how do we know if it can help us, or whether it’s worth anything anyway? Alex Quigley’s excellent posts here and here on just this conundrum are a must read if you are interested in using research to inform your practice. Some of the most influential research is influential because it is well-packaged. Inside the Black Box had a snappy title and it was a wonderfully thin, easily-read pamphlet. 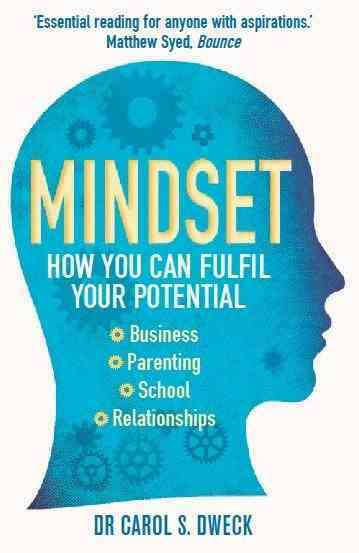 Carol Dweck has repackaged her Mindset work in a best-selling book. Marketing research effectively is a crucial part of winning over the hearts and minds of teachers. It’s that Bentley mantra again! If we want to increase the influence of research and develop evidence-based policy making then we need to change our structures. 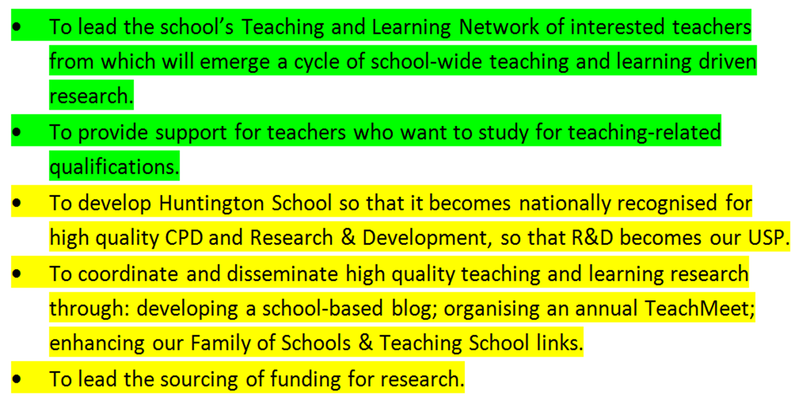 We are mid-way through a SLT restructure and at the heart of the new Director of Teaching and Learning’s brief is developing research-informed practice, working vertically within Huntington (green) and horizontally across collaborations regionally and nationally (yellow). Research-led schools are hard to find. Tom Sherrington’s school seems to have systematically embedded research within the school’s DNA; their Learning Lessons website is well worth a look. How do we learn how to teach? I’m lamenting the orchestrated dismantling of the university PGCE. The ITT courses at the University of York, for instance, are extraordinarily good compared to my training on the PGCE English course at the University of Sussex in the late ’80s. The PGCE at York has a research project as an integral element of the course. The course designers deliberately highlight the importance of being able to interpret and undertake educational research: teachers as learners from the outset – it’s the only way and whatever is replacing the modern university-based PGCE must have a distinct research element if we are going to have a research-informed profession in a decade or two, a generation or three. Masie Tubbs or Jen Ludgate? Maybe we shouldn’t worry too much about Masie Tubbs. Maybe it’s young teachers like Jen Ludgate, in her second year of teaching, already Assistant Leader of the English Faculty, co-director of #TLT2013 who we should be inspiring to engage in a meaningful and sustained way with educational research. Inspire her now and she might be inspired to be research-savvy for a whole career; she’s more important than me as well, me with only ten career-years left. Don’t inspire her and, as Rivkin, Hanushek and Kain established through their own research, she’s unlikely to consciously improve her practice significantly for the rest of her career: There appear to be important gains in teaching quality in the first year of experience and smaller gains over the next few career years. However, there is little evidence that improvements continue after the first three years. Spods – guilty as charged. However we would more likely been deem neeks by our fellow, non-teaching spods. A hybrid. Not so obsessed we find room for little else in our lives other than teaching, not sufficiently geeky that we so closely follows the minutiae of our profession, in this case, education research. Though there is a growing thirst for #EdRes or “evidence based teaching” from both schools and DfE. #DfEEBT. Though very like nerds, edu spods do tend to over use jargon or unfamiliar terminology in conversation (it is what frustrates other teachers, and parents at parents evening) however we do not go as fair as using obscure teaching references as most proud geeks would do. If we edu spods represent the most nerdy geeky teachers of our profession, than yes an A4 – educationendowmentfoundation.org.uk/toolkit/‎ EFF style crib sheet is a fair starting point, though a relatively poor substitute for Masie Tubbs testing out your own theories. Masie Tubbs needs direction in her training, though the first five years of teaching, maybe in order to move onto the upper pay bands, Masie needs to be able to demonstrate what she has leant and shared? Your last sentence betrays the real weakness in that argument. How much of this is *really* about educational progress for children – and how much about career progress for a certain type of very ambitious, right-on teacher? That said, I have grown *more* interested in the theoretical underpinnings of education the older and more experienced I have got – even if only because I wanted to find a methodology that more closely resembled real classroom experience as I know it. This is now at the extent I was part of Old Andrew’s rapidly-becoming-infamous Brick Lane Bloggers’ Curry last night. But it kind of worries me a bit that I am being sucked into a vortex of educational obsession as a result. The perspective gained by decades of experience casts a very different light on things, I have found, from the frenetic theorising of people less far into this work. I wonder whether you would be interested in the recent posts I have made about my experiences of Swiss education as an alternative but very successful model? John, this is an interesting blog. I have one area of concern. In the last paragraph you imply that teachers beyond 3 years of teaching do not improve much. The implication is that new teachers are where it is at. Really? Is it really credible that teachers with more then 3 years of experience can’t make sustained improvements in their practice – or is it that the rate of improvement slows (which you would expect), or that many don’t make progress (but could)? This is dangerous, because it elevates the new teacher above more established teachers, and sends out an unhelpful message. I also think it unlikely that you couldn’t achieve significantly in the area of research in the 10 years you have left. More thought (and maybe more research) is required before such statements are made (and definitely before any implementation). I’m not sure that it does imply that. I read it as it being harder to redefine someone’s sense of who they are as a teacher the further into their career they are – and that’s not me suggesting anyone should have to redefine if they are happy as they are, research based or not! I tend to see getting into research as something that I want to give opportunities for people to do rather than a policy that I would have everyone follow. I was talking to someone recently about starting this with a trickle feed from my reading and recommendations of books in our slowly developing staff CPD library but I’d resisted because of my worries around “Here he goes again, pontificating and telling us we could all be better,” responses but I was encouraged to do so. I suppose my stance was quite arrogant assuming that I know how others will respond in any situation and even if I was right then there may be others who would be interested in developing their reading so why should my concerns over the potential responses from those who might not be stop me. Younger teachers will always be more interested in new paradigms – they are still searching for one of their own. We’ve all been there. Older teachers have probably already found one that works for them, which isn’t to say they don’t continue to develop. They will be using more resilient, deep-embedded skills that only come with thousands of hours’ teaching, not to mention age. If they have less time for easy-come-easy-go over-arching theory, that may say more about the theory than the teachers! Personally, I feel I have done all my best work in the latest ten of my 27-to-date – and I’m still developing (when ‘the system’ isn’t busy preventing it). I was already mindful of John’s previous post about valuing experienced teachers, which had a lot of sense in it. John, thanks for the reply. The post featuring Dave does celebrate him, but I’m not sure it celebrates all experienced teachers, or the place of experience in teaching. I think experience is generally under rated (and not just in teaching). There is an over emphasis on new staff, who are untainted by past practice and eager to learn and contribute. These things are good, but the backbone of a school will be the more experienced staff (who may, indeed, not be contributing as much as they could be). They are likely to be around longer, have seen more in the local context, and be pretty committed. They need to be embraced in the development plans of the school, and care needs to be taken that the emphasis on the new (staff and ideas) doesn’t send an unintended negative message to them. In some places, the first battle is to get to see teachers and leaders even to be open to the possibility that research can teach us anything.